Robert Heinlein? Mark Twain? We're not quite sure who originally said it but our 2017 tote bag features the comical, "Never try to teach a pig to sing ... it wastes your time and annoys the pig." Many of you have also asked if our Queen Victoria 2016 tote bag with her famous (infamous?) quote, "Beware of Artists: they mingle with all classes of society and are therefore the most dangerous" is still available and the answer is YES! 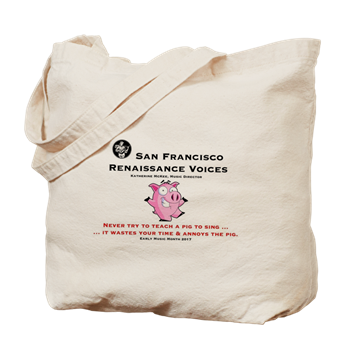 Event though Early Music Month happens in March you can get these bags all year long - just CLICK HERE to get either - for a mere $20 each!